A short film to show the diversity of Cornwall’s magnificent gardens, from the world famous to the hidden gems. Video provided by Visit Cornwall. Trewince is the ideal base for visiting the Cornwall’s Gardens. Visit our Bookings page now to check availability. Cornwall has successfully held the UK holiday title since 2009, shunning competition from across the country for an impressive six years. It is a tremendous feat but we would love to keep the crown where it belongs for another year. Vote for Cornwall as the Best UK Holiday Destination. Visit Cornwall, the official tourist board, is calling for everyone across the UK with a love for Cornwall to cast their vote to ensure that Cornwall remains the number one UK Holiday Destination for the 7th consecutive year. Once again there’s a great Prize Draw with some fabulous holiday prizes and it only takes a minute. Love Cornwall? 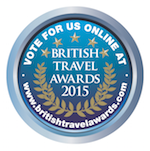 Vote now for Cornwall as your favourite UK destination.